Erín Moure’s translating career can be considered on two planes. The first, the one she began in 2000 in collaboration with Robert Majzels, was the translation of domestic works which, in this case, involved Nicole Brossard’s Installations. Two further translations of Brossard’s works, with Majzels as collaborator, appeared – Museum of Bone and Water (Musée de l’os et de l’eau) in 2003 and Notebook of Roses and Civilization (Cahier de roses & de civilisation) in 2007 – before Moure turned her sights on a book by another Québécoise poet, Louise Dupré, Just Like Her (Tout comme elle). Moure’s second plane, the translation of international works, began in 2001 with Sheep’s Vigil by a Fervent Person, her translation from the Portuguese of Fernando Pessoa / Alberto Caeiro’s O Guardador de Rebanhos. Moure next focused on a small autonomous region in Spain’s northwest – Galicia – where she discovered a poet writing in the Galician language (which Franco attempted to eliminate). Charenton appeared in 2007 and m-Talá in 2009. 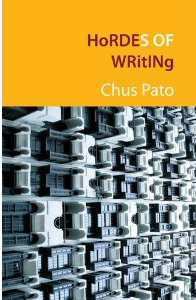 Hordes of Writing, then, is Moure’s third translation of a work by Chus Pato. It was simultaneously published in England by Shearsman Books. It is easy to see how this quote would appeal to someone in Pato’s position, considering that Franco, himself a Galician, during the Spanish Civil War suppressed both the people and the language of the area, which had been granted autonomy during the prior Second Spanish Republic. It is also easy to see how this quote would have coloured Pato’s poetics. the Rhine, frozen, and continued on foot along Imperial trails toward the country of great forests // heading always toward . . .
which leads us to the Suevi, a Germanic tribe, who founded the Suebic Kingdom of Galicia in about 406 C.E. but, instead, her cultivation is dedicated to an evolving of language towards a poetics and the opening of unique literary spaces where “the literary works of the Marquis [de Sade] (one of her bedtime favourites) could only be understood as another inventory and as the writer’s attempt to make bearable the dark night of the world” (22). We, the readers, then face the question whether that dark night of the world is the reading of the Marquis between covers “or her never fatal attraction to her currently uprooted, jailed or dead comrades . . . in which Ophelia was brutally run over when she tried to identify her brother amid the corpses of the victims of the latest bombardment” (24), which take us back to Franco and the Spanish Civil War as read through a combination of Hamlet and the Marquis de Sade. John Herbert Cunningham is a Winnipeg writer. He reviews poetry in Canada for The Malahat Review, Arc, The Antigonish Review, The Fiddlehead and The Danforth Review, in the U.S. for Quarterly Conversations, Rain Taxi, Rattle, Big Bridge and Galatea Revisits, and in Australia for Jacket. Ottawa: BuschekBooks, 2011; ISBN 978-1-894543-68-2; 89 pp., $17.95 paper. Exeter: Shearsman Books, ISBN 978-1-84681-167-2.